Op. 10, No. 1 - Concerto in F Major - La Tempesta Di Mare ("Storm At Sea”) originally existed in two other versions: RV 98, a Chamber Concerto (a concerto for a small group of solos instruments without orchestra) for flute, oboe & bassoon; and RV 570, a fuller version for flute, oboe & bassoon, with strings. The name La Tempesta Di Mare (“Storm At Sea”) seems to have been popular with Vivaldi, in that he also used that name for one of the Opus 8 Concertos, the collection of 12 Violin Concertos which includes The Four Seasons. As for the programatic aspect of the music, the “storm” is presumably represented by the opening ritornello of the 1st movement, with the 2nd movement representing a momentary calm before the return of the activity in the 3rd movement. Several changes have been made in this arrangement: short introductions were added to each movement (1st movement -1 bar; 2nd movement -1 bar; and 3rd movement - 2 bars); and the 3rd movement has been changed from the meter of 3/8 to the meter of 3/4, and all of the note values have been doubled. To ease practicing with the “complete” version of the MIDI accompaniment of the concerto, measure numbers run throughout the concerto from 1 to 245 (the 2nd movement starts at measure 77 and the 3rd movement starts at measure 101). Op. 10, No. 3 - Concerto in D Major - Il Cardellino (“The Goldfinch”) (F. VI, No. 14; RV 428) originally existed as RV 90, a Chamber Concerto (a concerto for a small group of solos instruments without orchestra) for flute (or violin), oboe (or violin), violin & bassoon (or cello). 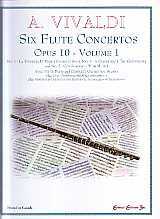 This is the most popular of the 6 concertos of Opus 10; Vivaldi used the opening figure of the solo flute in the 1st movement (1-7) again in Op. 10, No. 6 (in Volume 2) in the 1st movement (37-40). Op. 10, No. 5 - Concerto in F Major - Con Sordino (“With Mute”) (F. VI, No. 1; RV 434) originally existed as RV 442, a Recorder Concerto. The nickname “con sordino” comes from the fact that all of the strings parts are marked “con sordino” (“with mute”) in all three movements - probably because it was originally a concerto for the recorder, a much quieter instrument than the flute. For the Opus 10 version, Vivaldi wrote instructions on the manuscript for the publisher to transpose the 2nd movement up a tone from F Minor (the tonic minor) to G Minor (which Vivaldi usually indicated with one flat) to make it more suitable for the flute. These instructions are often ignored by both publishers and performers. For comparison, look at the version of this concerto contained in Classical Collection Inc.’s INTERMEDIATE LEVEL FLUTE - VOLUME 1; it does not use harpsichord and the second movement is in F Minor. In this arrangement, a short introduction has been added to the 1st movement (3 1/2 beats) and 3rd movement (1 3/4 bars).